department vacancies of Junior Assistant, Lab Asst Jobs will be through written exam only. For JKSSB Junior Assistant Jobs candidate must have Degree with typing speed of 35 wpm or Computers Degree qualification is required. For Lab Assistant jobs 10+2 with science group qualifications is required for this JKSSB Recruitment Exam 2017. Written exam will be objective type only. Last date for online application form submission for this JKSSB Lab/Junior Assistant Vacancy Recruitment is 11-11-2017. More details about this Jammu Kashmir SSB recruitment exam notification is given below. Exam Date and Admit Card available dates will be issued later. 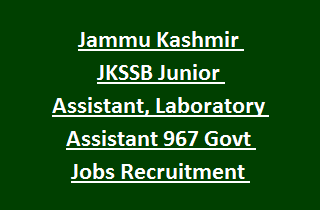 There are total 967 Junior Assistant, Lab Assistant jobs in this Jammu Kashmir State Government Education Department recruitment 2017. As on 01-January-2017 candidates age limit is 18-40 years. For SC/ST/RBA/ALC/OSC candidates 18-43 years, 42 years for PH candidates and 48 years for Ex serviceman. For Junior Assistant Jobs degree with 35 wpm typing sped on computer is required. OR Computers Degree qualified candidates are eligible to apply. For Lab Assistant Jobs 10+2 in Science group is required. As per the Jammu & Kashmir State govt norms. Application fee is Rs.350/- to be paid in CSC centers or offline using chalan or online at the time application form submission. There is no Viva test and interview for this JKSSB Junior Assistant & Lab Assistant jobs. Candidates will be selected based objective type written test only. There will be negative mark for each wrong answer. Online applications have to submit by eligible candidates on or before 11-11-2017. It is mandatory for submission of form online and no other mode of applications are will not be considered. Applications forms will be accepted through the official portal of JKSSB @ssbjk.in.